Every time I live abroad, Papa and Maman Ritournelle never fail to pay me a visit for a week or so. As they spent time with me here in New York until Friday, I took time off work in favor of my hostess duties and did not write my usual weekly post. 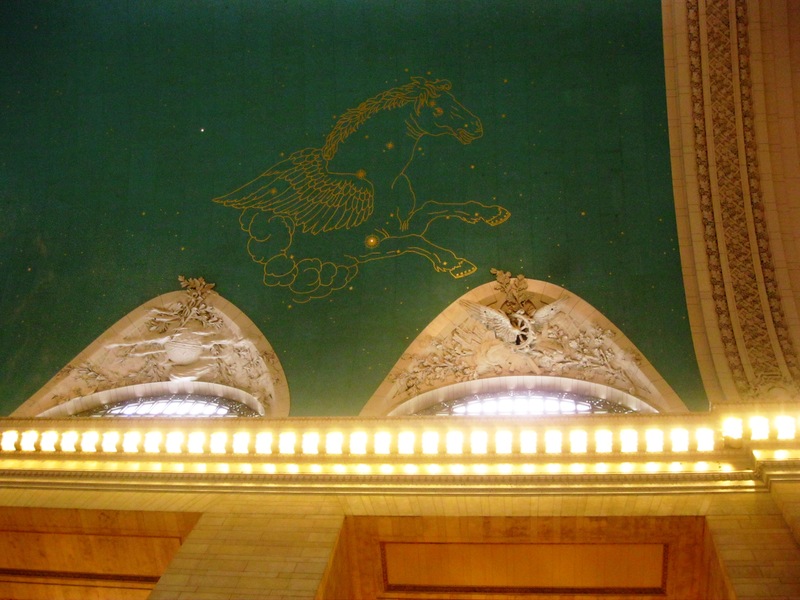 Now that my staycation is over, I thought you might enjoy a few bits and pieces of my touristy finds in the city. 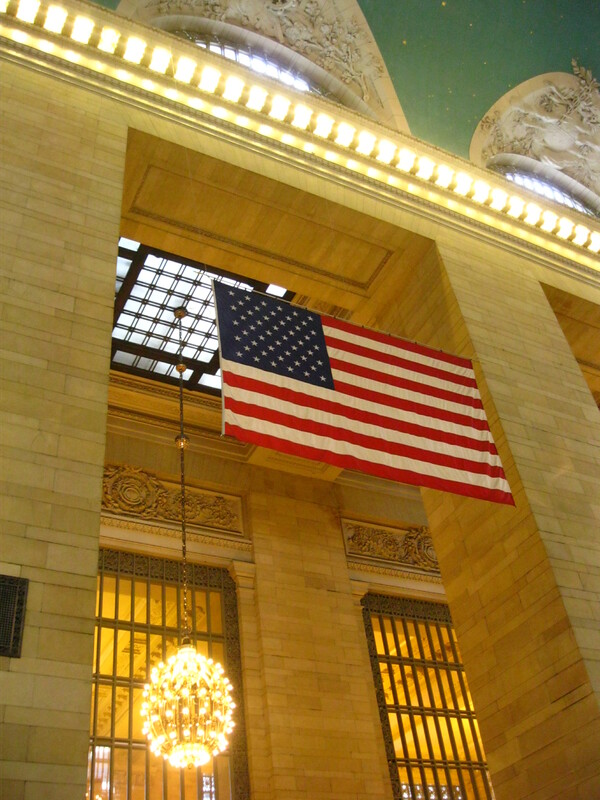 After all, many of you have expressed how you long to travel to New York! These are the pictures of our first full day of sightseeing; more will follow. 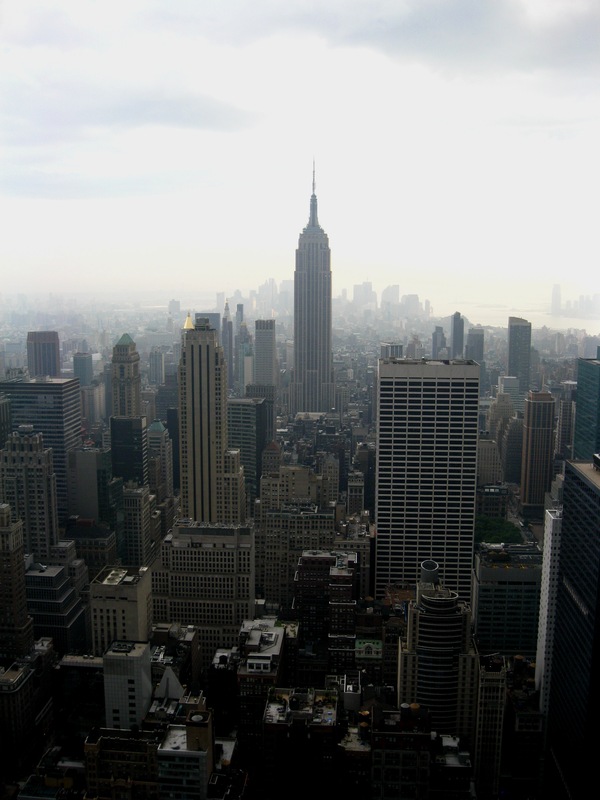 Don’t hesitate to comment with your New York City tips! 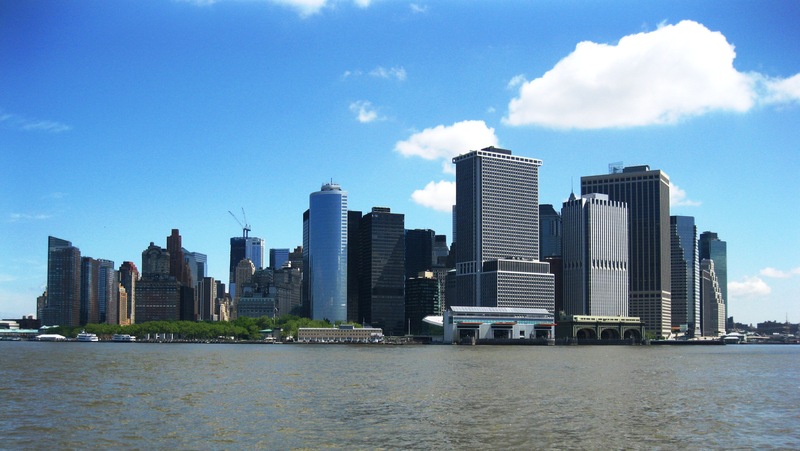 Taking a boat tour around Manhattan is a great way to start a stay in New York City as it allows you to discover the city’s skyline, major monuments and bridges in 3 hours. The Financial District is located in the southern tip of the island shown above. Its landscape was dramatically changed 10 years ago as the World Trade Center Twin Towers dominated it with their 110 floors each. 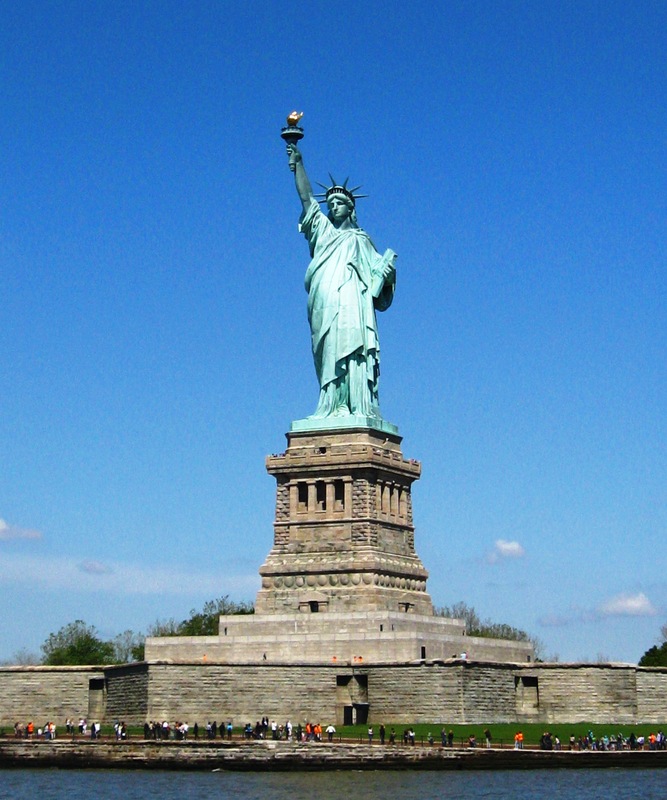 The cruise also takes you near Ellis Island, the gateway for immigrants to the United States until 1954, and the Statue of Liberty, a gift from France. A very touristy yet always magical sight! 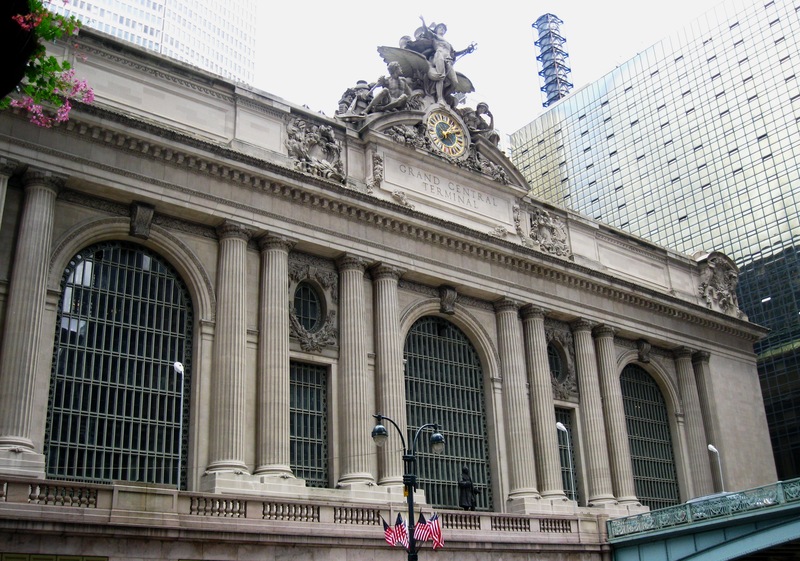 Back to dry land, we crossed Manhattan to reach Grand Central Station on Park Avenue. I had been told about the aesthetics of the building and indeed, for a train station, it did not disappoint. 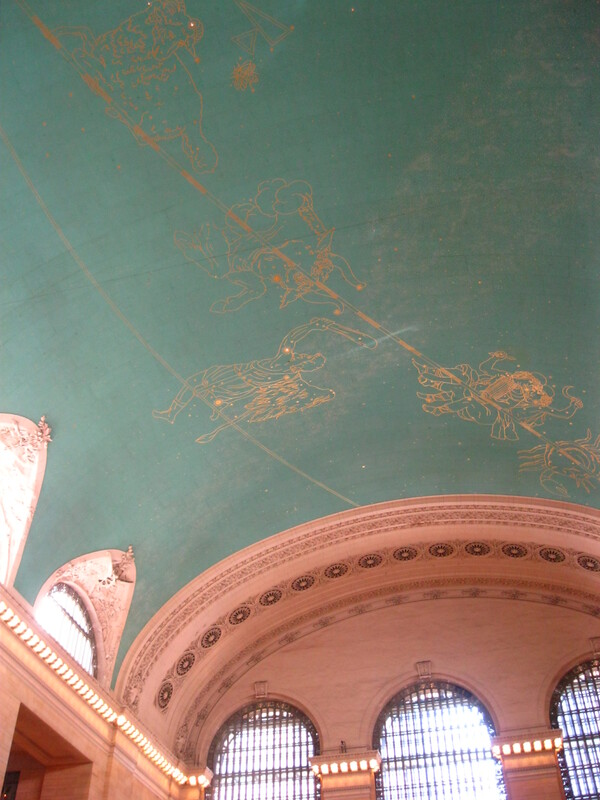 The massive main hall was especially impressive; its astronomical ceiling was painted by French artist Paul Helleu in 1912. 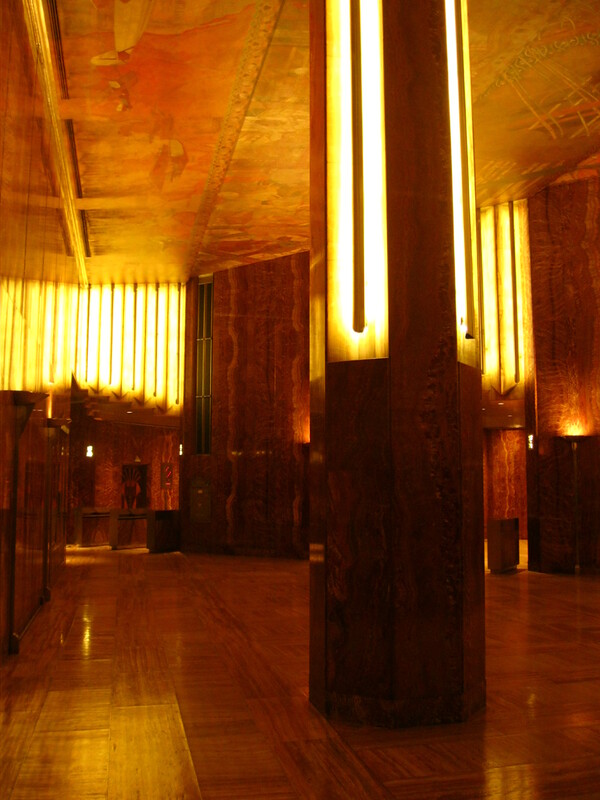 The nearby Chrysler building is a true Art Déco fantasy built in the midst of the Depression. 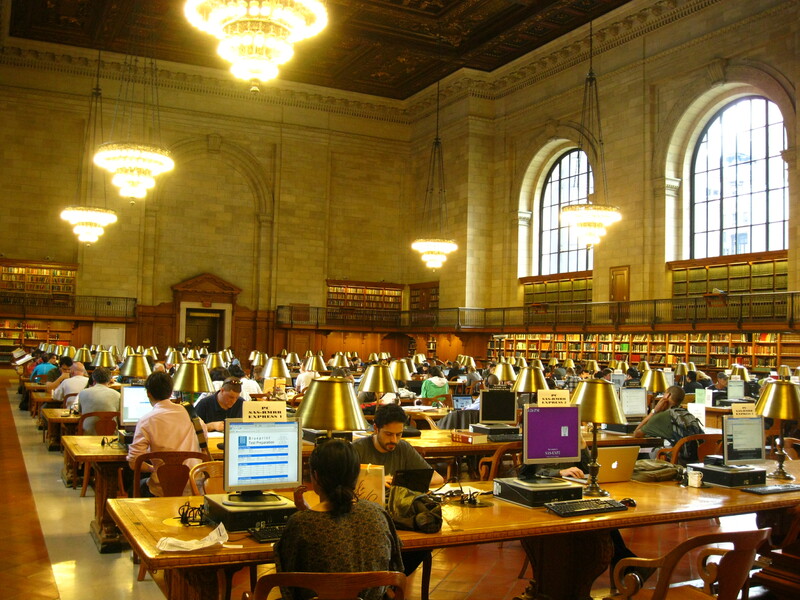 A few streets east on 5th Avenue, the New York Public Library is an oasis of tranquility in the hustle and bustle of the city. 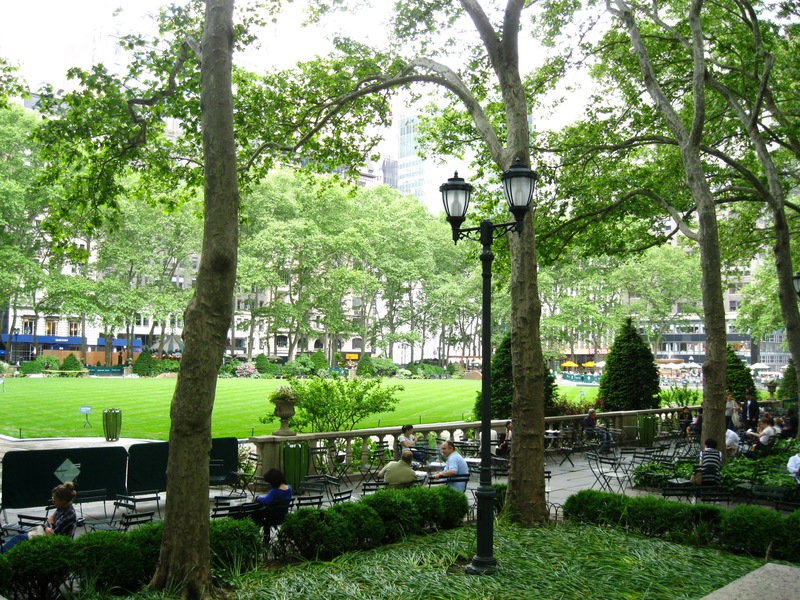 Facing the building, Bryant Park used to host New York fashion week’s shows until last year. 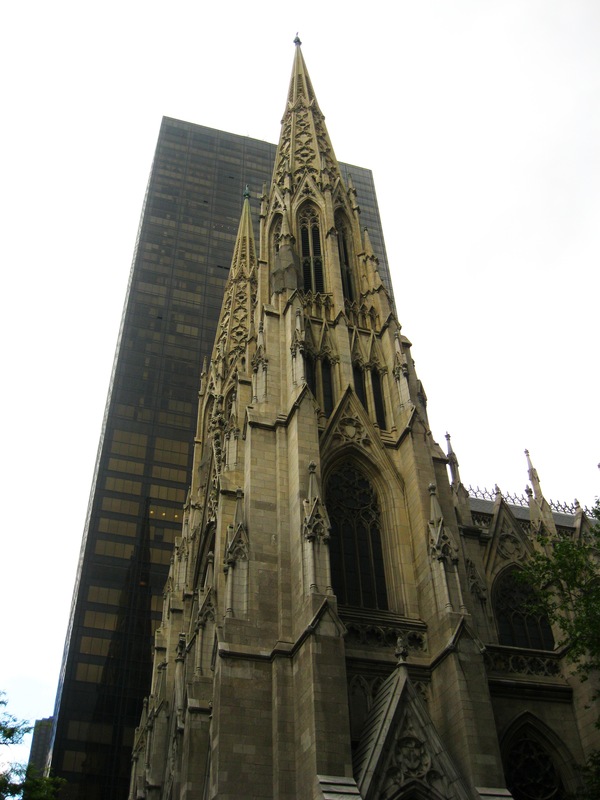 Still on 5th Avenue, Saint Patrick’s Cathedral can seem an incongruous monument among the surrounding stores and neighboring Trump Tower. 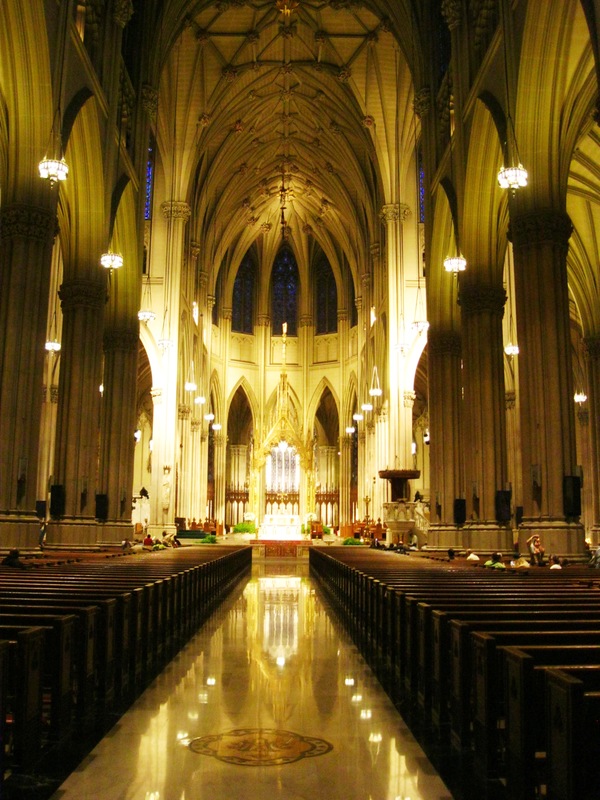 America’s largest catholic cathedral can accommodate 2,400 people. 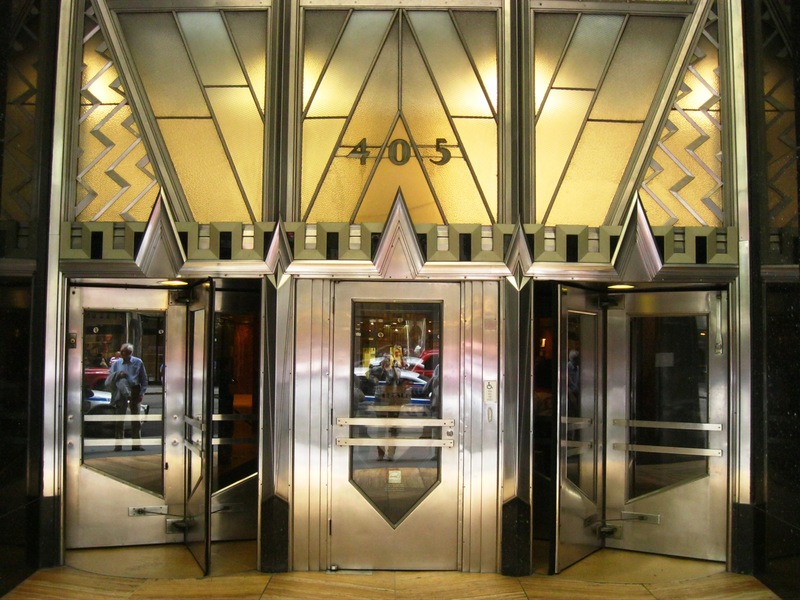 Right across the street, Rockefeller Center towers over the area with its centerpiece boasting 70 floors. An observation deck allows you to enjoy a 360° view of Manhattan and beyond. Alas, it was raining when we reached the top but the landscape was breathtaking nonetheless. Do you see the second-tallest building on the right, the white one with black windows? That’s where the Chanel headquarters are located. 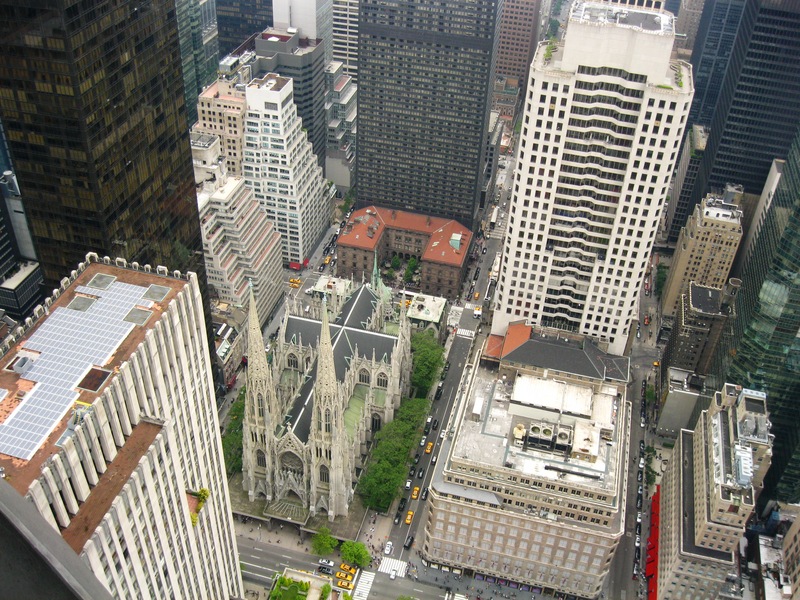 Other views: Saint Patrick’s Cathedral – still incongruous – and the Empire State Building – oh so Gotham. As my parents and I are French, one of our main concerns is where to eat well. 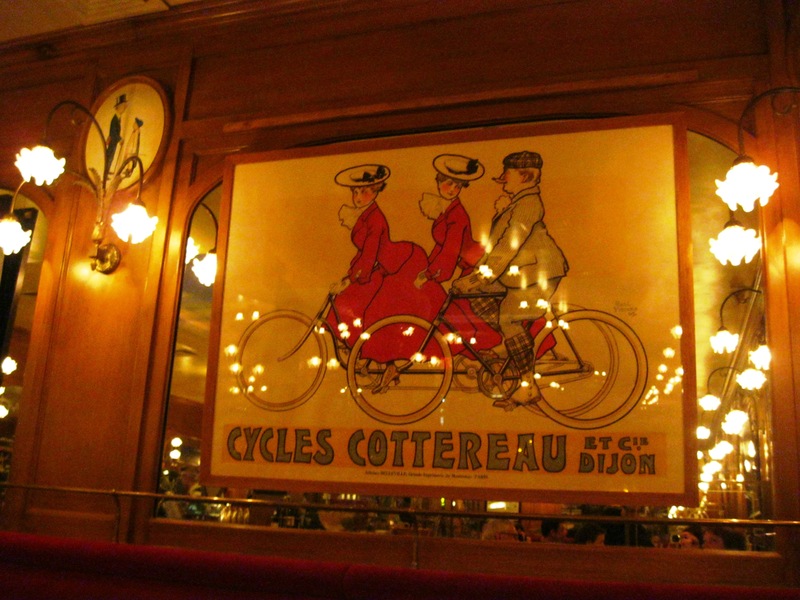 It would be a pity for us to travel so far to America and dine in a French restaurant. Yet when we noticed that Alain Ducasse has a bistro a few steps away from the hotel, we were irresistibly drawn to it. When seated at Benoit, you are transported to a brasserie in the Parisian Montparnasse area with excellent food and service at a reasonable price. And who could resist such a display of desserts? 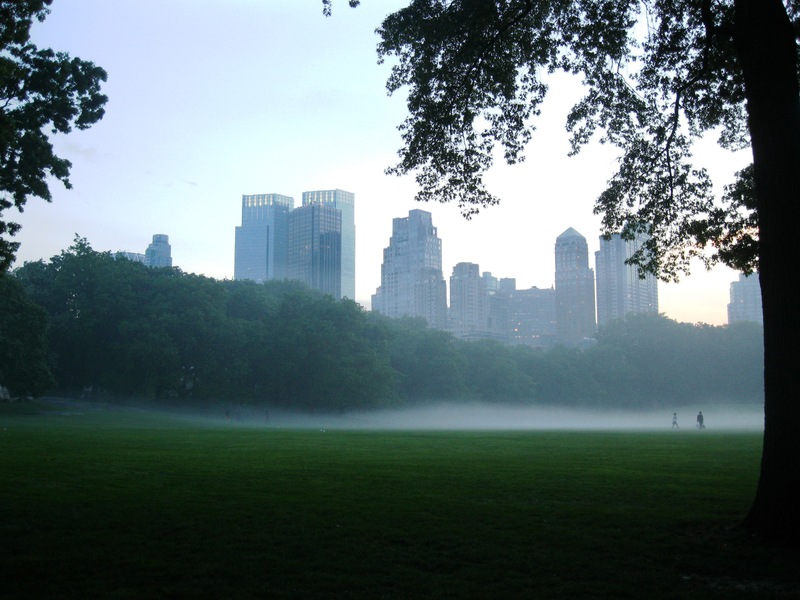 And finally, I ended my day with a walk in a misty Central Park after a heavy rain. Lorsque je vis à l’étranger, mes parents ne manquent pas de me rendre visite pour une petite semaine. Comme ils étaient avec moi à New York jusqu’à vendredi, j’ai pris congé pour leur servir de guide et n’ai pas écrit mon billet hebdomadaire habituel. Maintenant qu’ils m’ont laissée tranquille, je peux enfin partager avec vous mes trouvailles touristiques. Après tout, vous êtes nombreux à m’avoir confié votre envie de voyager à New York ! Voici les photos de notre première journée entière de visites ; d’autres suivront. N’hésitez pas à laisser vos conseils et réactions en commentaires ! Faire le tour de Manhattan en bateau est un bon moyen de démarrer un séjour à New York : cela donne une vue surprenante sur la forêt de gratte-ciels, les ponts monumentaux et des coins inconnus de l’île (vous saviez qu’il y a des cloîtres enfouis dans une forêt à la pointe nord ?). Le tout en 3 heures. Le quartier financier occupe la pointe sud de l’île. Son aspect a changé de façon dramatique il y a bientôt 10 ans comme les tours jumelles du World Trade Center le dominaient de façon spectaculaire avec leurs 110 étages chacune. 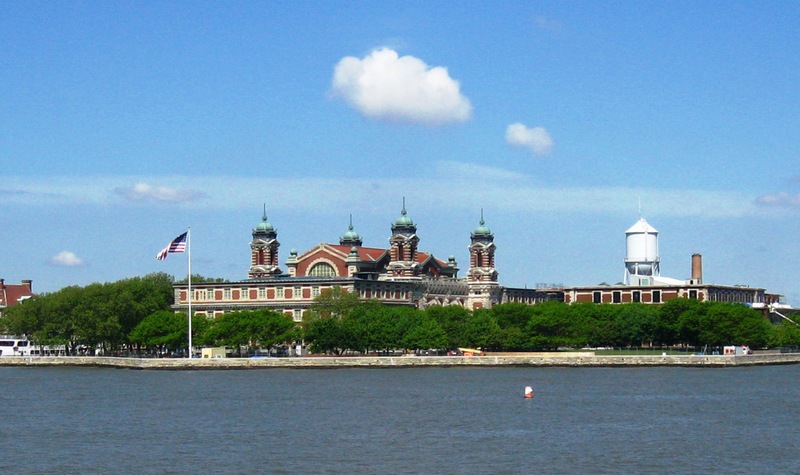 Le tour en bateau nous mène près d’Ellis Island, porte d’entrée des immigrés aux Etats-Unis jusqu’en 1954, et de la Statue de la Liberté, Dame de fer américaine offerte par la France. Un site très touristique mais toujours magique ! De retour sur la terre ferme, nous avons traversé Manhattan pour nous rendre à Grand Central Station. J’avais entendu des éloges sur l’esthétique du bâtiment et en effet j’ai été étonnée de la beauté de cette gare. Le hall massif était particulièrement impressionnant. Sa fresque astronomique a été peinte par l’artiste français Paul Helleu en 1912. 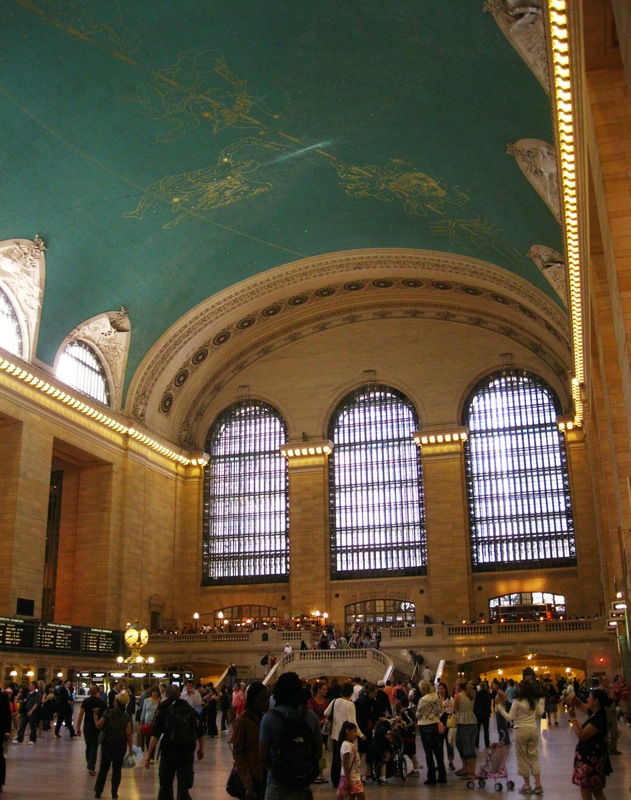 Empruntée quotidiennement par 500 000 personnes, Grand Central Station est une ville dans la ville. La fameuse Magnolia Bakery y a ouvert sa 4e boutique ce qui m’a permis de goûter les mignons cupcakes préférés de Carrie. 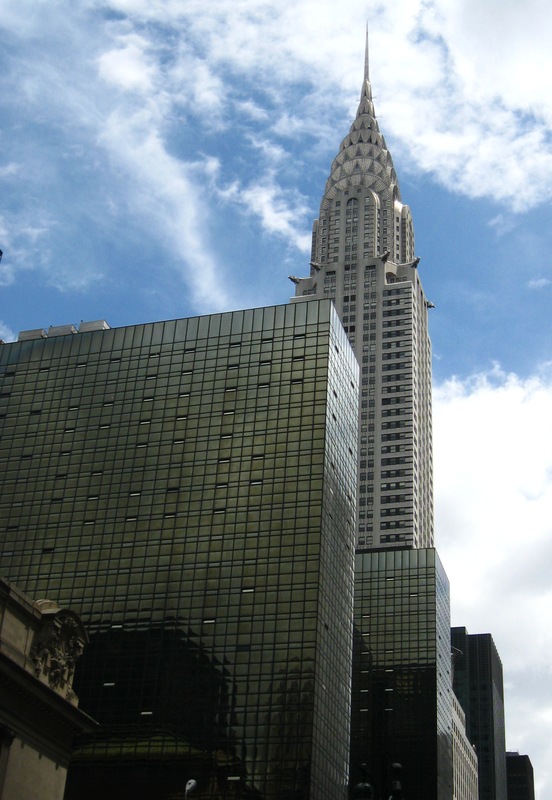 Tout proche, le Chrysler Building est une véritable fantaisie Art Déco construit en pleine Dépression. 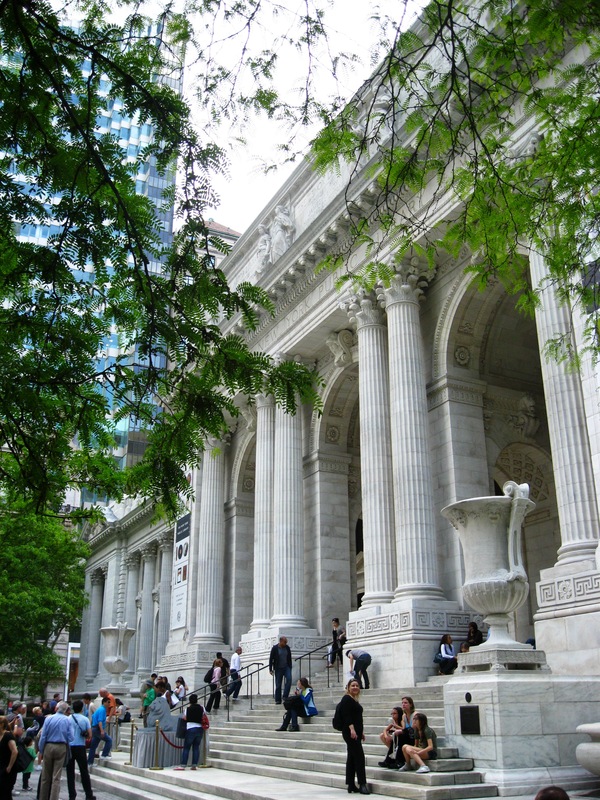 Quelques rues à l’est sur la 5e Avenue, la New York Public Library est un oasis de tranquillité, loin des klaxons et sirènes omniprésents de la ville. Face au bâtiment, Bryant Park accueillait les défilés de mode avant qu’ils ne déménagent l’année dernière. Toujours sur la 5e Avenue, la cathédrale Saint Patrick semble insolite parmi les boutiques de luxe et gratte-ciels environnants. La plus grande cathédrale catholique aux Etats-Unis peut accueillir 2 400 personnes. 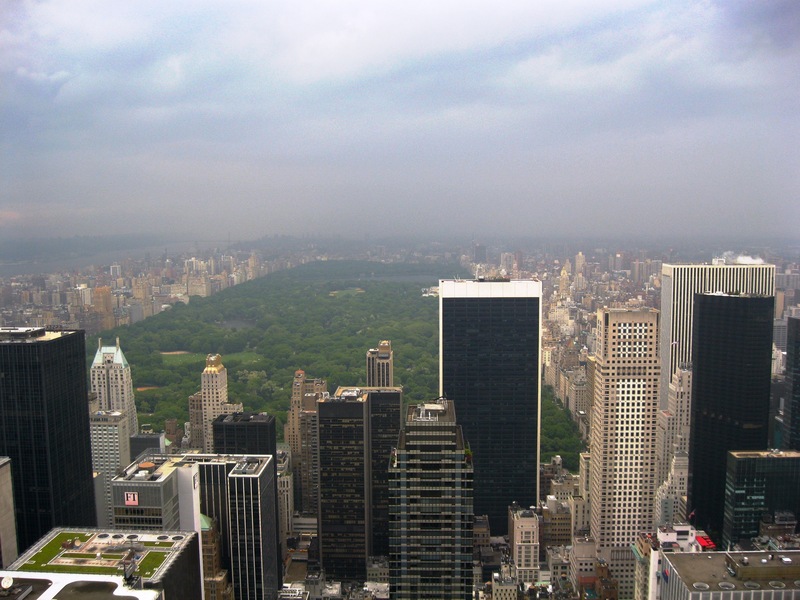 Juste en face, le Rockefeller Center domine les environs, fort d’une pièce principale haute de 70 étages. Un observatoire permet de jouir d’une vue à 360° sur Manhattan et au-delà. Malheureusement il pleuvait quand nous sommes arrivés en haut mais le paysage était tout de même époustouflant. Vous voyez la 2e plus grande tour sur la droite, la blanche avec des fenêtres noires ? C’est là que se trouve les bureaux de Chanel aux Etats-Unis. Autres vues remarquables : la cathédrale Saint Patrick, toujours insolite, et l’Empire State Building. Il a une allure très « Gotham City », vous ne trouvez pas ? En bons Français, mes parents et moi sommes soucieux des restaurants à fréquenter. Ca serait dommage de voyager aussi loin pour ne pas tester la cuisine locale, mais lorsque nous avons appris qu’Alain Ducasse possède une brasserie dans le quartier, nous n’avons pas pu résister. Diner chez Benoit, c’est être téléporté dans un restaurant à Montparnasse avec une bonne carte, un service francophone et des prix raisonnables. Vous avez vu comment ils présentent leurs desserts ? Et pour finir ma journée, une marche rapide dans un Central Park brumeux après la pluie ! Oh how I love New York City! And when you live somewhere, it’s all too easy to take it for granted and forget to enjoy the magical sights that exist in your city. So like you, I always relish the opportunity a friend visiting provides to be a tourist in your own city! Really hoping I can make it to NY in the early Autumn (just need to find accommodation) – if so, I’d love to explore the city with you! That’s so true: I realized during my parents’ visit that I spend way too much time in front of the computer instead of exploring New York City! Do let me know if you come this fall; I’d love to show you around! Have you looked for hotels on tripadvisor.com? I’ve always been satisfied with my finds on there. 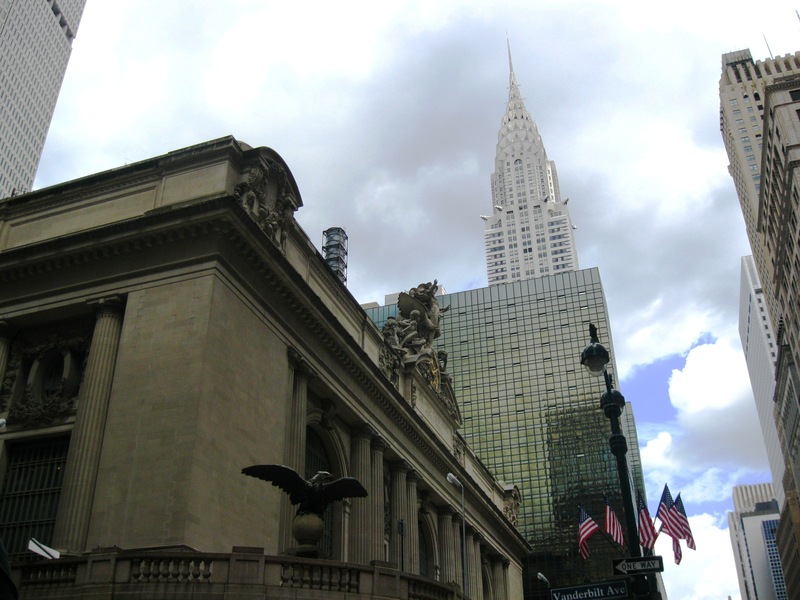 Great post Anne and what great photos especially of my fav Chrysler building. Thxs for sharing and I hope your mum and dad enjoyed their time in NY. Excellent photographs and what a lovely tour for Maman et Papa Ritournelle. NYC really has a beautiful skyline. Thank you for sharing! Haha glad the nicknames are sticking! Thank you for your lovely comment, Milla. How long did you live in New York? The nicknames are here to stay! I lived there for two fun, crazy years. I lived on Christopher Street though dreamt of Park Avenue! It was so much fun but at the end, I was burnt out. It was by far the best adventure I had in my early twenties. Everybody should live in NYC at least once. Are you loving it? Do you think you’ll return to Paris? New York was rough for me at first but as I’ve been getting used to the city and now live in an apartment I like, I’m really starting to feel at home! Getting a visa to stay permanently seems hard so I’ll probably have to go back to Paris anyway when my contract ends, but who knows! oh! you are making me miss new york so much. it’s funny you should post about this – we just finished a week in my new york history class that focusses on the rise of new york as we know it today, the touristy spots, the skyscrapers, the city of white. did you know they used to describe the spaces between the skyscrapers as “canyons”? Your first photo made me think of that. i hope you are well – and when are you going to be in paris! and i replied to your comment on my blog with the link. Thanks Hannah-Rose! I didn’t know about the “canyons”; it’s quite an accurate word! Right by the Chrysler there was a street vendor selling a replica of the famous picture showing construction workers in the Depression sitting on an iron bench very high above ground. We tend to forget the most famous buildings in NY were built by men who risked their lives and worked in poor conditions. Stunning photography! I long to go to NYC!!! Anyhow, what I have come to find is that getting a NY Pass for 3 days is well worth it. 3 weeks ago my friend Tom was visiting me and he ended up staying for 2 weeks. He got this pass and it was great because, aside from the typical tourist attractions, it included many interesting tours plus I don’t have to be present to show him around (resulting in him walking around by himself, what a nice change!). Can’t wait to read more from your point of view in the same city! Thanks for the link! I learned about the pass too late. What a shame, it is indeed a great option for visitors and so much cheaper than buying every single ticket. I know, right? I only found out about this pass thingy 2 months ago, otherwise I would have recommended it to almost everyone who came her last year! What I have been thinking, though, is to just use it for my own benefit and finally see all the great sights New York has to offer by myself. I still haven’t made it out to the Statue of Liberty, for instance, and the Top of the Rock is unknown terrain to me as well. So whenever I will leave I will take some time for just the pass and go look at certain things! I had no idea about this Ducasse spot- I will of course have to try it on my next visit. I am dying to go to Bolud at some point too. 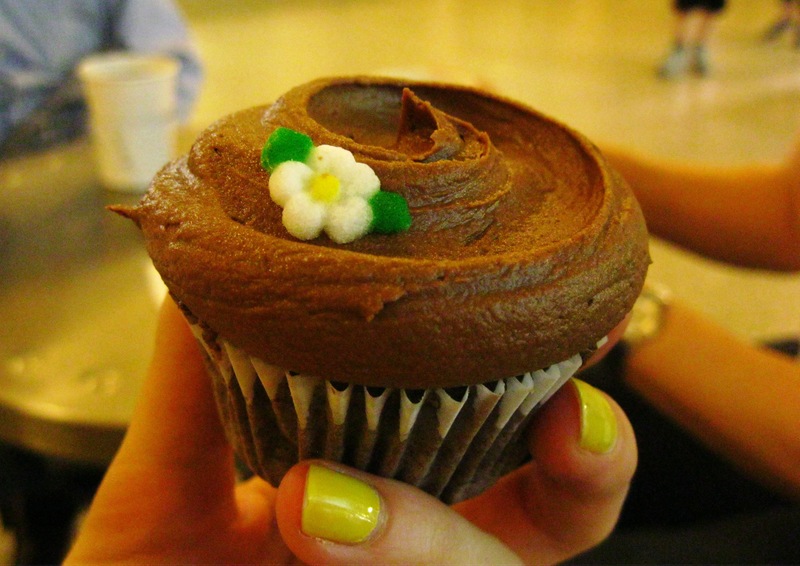 The photos of your Mimosa nails and Magnolia cupcake was heaven, they complement each other perfectly! 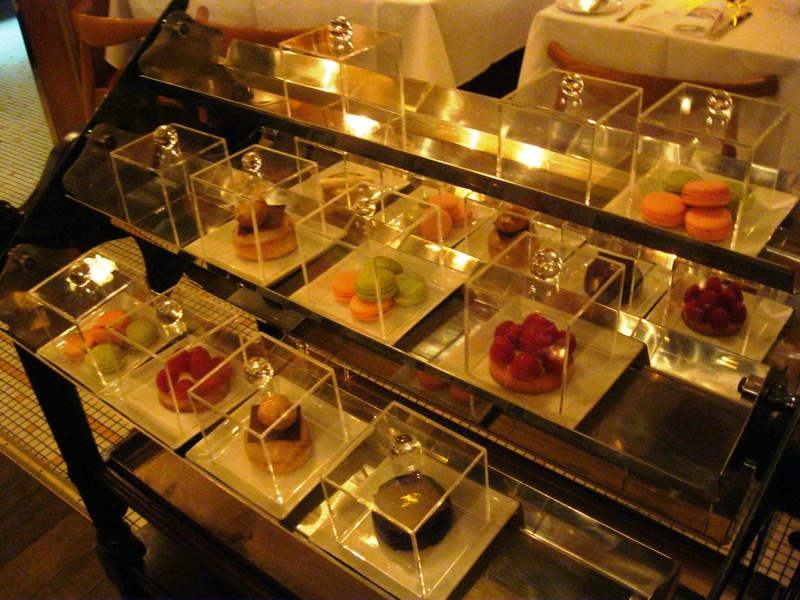 I have an even better French cuisine spot to recommend you: L’Atelier de Joël Robuchon at the Four Seasons. It’s a splurge, but so much worth it! Will feature it on my blog since I was lucky to experience this restaurant with Papa and Maman Ritournelle on their very last night in New York. You know me too well Anne! I actually had the chance to go to L’Atelier de Joel Robuchon in Paris last year! It was a delight. The open air concept, bar style seating there, was a total experience- was it the same in NYC? I would document my food adventures more if I weren’t so worried about taking photos in dining room! I can’t wait to see what you had and your experience vs mine! Oh you went to the Paris Atelier, that’s awesome! I knew you’d like that kind of restaurant ;-) From your description the New York one is different in terms of layout and inside the hotel. Looking even more forward to sharing my experience and getting your feedback now! You really did give them the grand tour of New York City! We love the shots of Midtown, and the images from the Empire State Building are breathtaking. Even if you have lived in Manhattan your whole life, it’s nice to be a tourist for a minute and learn something new about the city. Great post!